I’m currently snuggled up on my couch, under a blanket during snow day #6! I love following my PLN on Twitter and staying connected during all of this time off. Today I’ve noticed many posts from people who are attending various conferences. They’re sharing their experiences (including tools and resources) through great tweets and pictures. I love seeing these tweets because it reminds me that you don’t always have to be present somewhere to learn. Speaking of conferences, who’s going to NCTIES 15!?! If you’re like me, you have been looking forward to the annual NCTIES conference for a while. With all of this extra time at home to connect and learn, I’ve gotten even more pumped to attend sessions, talk to and meet people who are a part of my PLN and most importantly, capture these moments in a way that allows me to bring them back with me and share! Whether you’re a tech conference expert, or someone who is attending for the first time, the sheer amount of information you encounter at an event like NCTIES can be very overwhelming. I am naturally more introverted in large settings such as conference sessions, but that hasn’t stopped me from finding ways to make the experience awesome and memorable. Since NCTIES 15 is next week, I thought I’d share some tips that can help to make this time of learning and connecting more awesome for you. Here they are in no particular order. The schedule option allows you to access the full conference schedule, by date, and view each session that is offered. 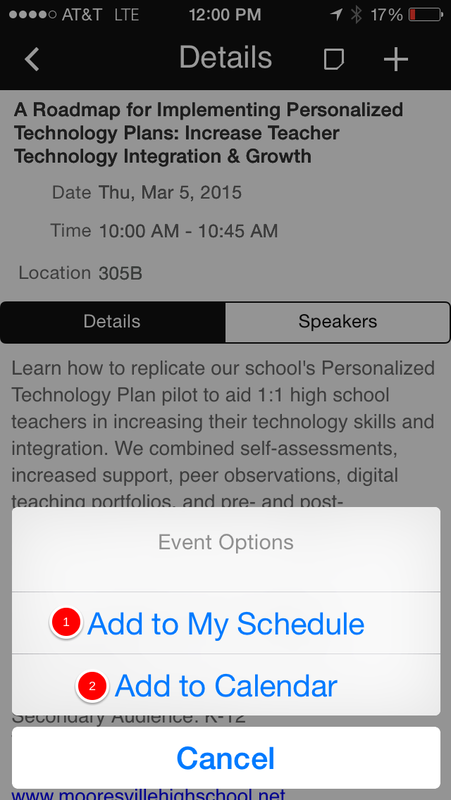 The my schedule option allows you to see the sessions that you’ve added to your schedule within the app. On the session details page, you can either add the session to your schedule within the app (1), or add it to your phone or device’s calendar (2). I prefer to add it to my calendar, so that way it appears in my Google Calendar which is where I chronicle all of my day to day scheduled activities. 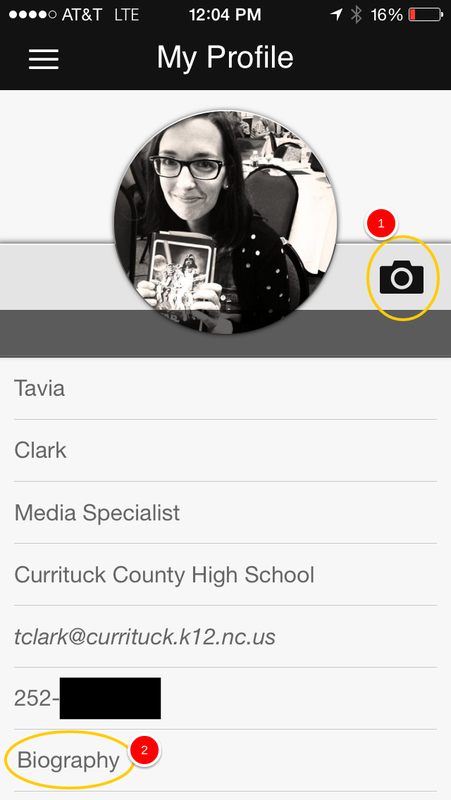 The NCTIES app also allows you to update your profile with information that will make it easier for others to connect with you. I always think it’s a great idea to add a picture (1) to your profile to make it easier for people to recognize you. You can also add information to the biography section (2) to give other attendees more information about yourself. Since I utilize Twitter so much, I chose to put my Twitter handle in the biography section of my profile. You can find more information on the NCTIES app on the conference Web site. I’m sure I’m not telling you anything you don’t already know, but it’s very easy to go into information, resource, tool overload while attending a conference like NCTIES. You will see some AWESOME presentations that will not only give you information, but hopefully inspire you. However, with the pace of each conference day and the amount of sessions most people attend, it is easy to forget things that you heard/saw or for them to get lost in the myriad of awesome stuff flying around. This is why curation is so important. Before you leave for the conference, try to decide how you want to collect, curate and save the information you receive, as well as, your own thoughts and notes about each session you attend. 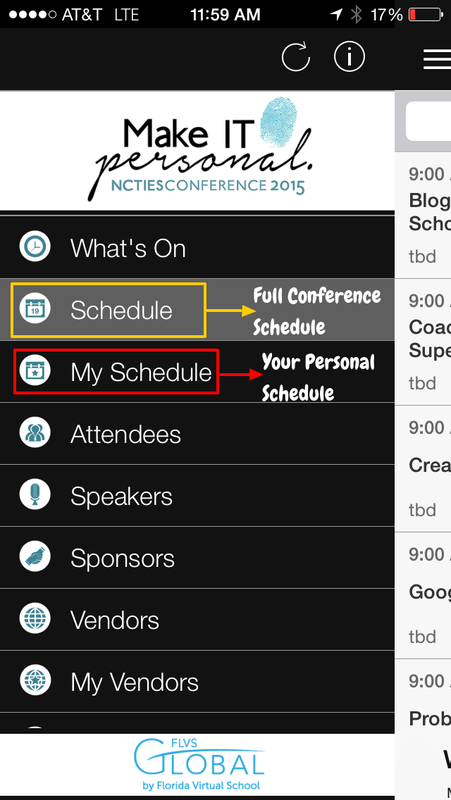 The NCTIES app allows you access to a notes function for each session that you add to your schedule inside the app. Some people will choose to take notes this way. For me, it is easier to type on an actual keyboard during the quick paced sessions. I’ve curated and taken notes in different ways over the years. 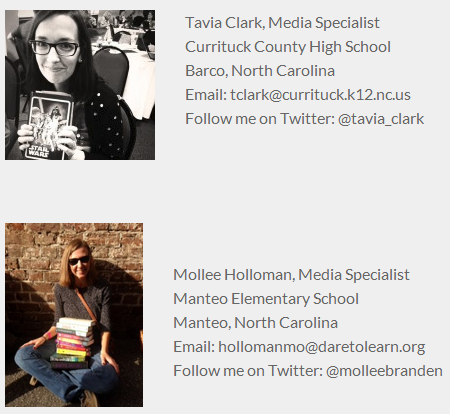 Many times I’ve set up a NCTIES folder in Google Drive and then created a document for each session that I attend that includes all the links and resources from the presenters, and notes that I took. 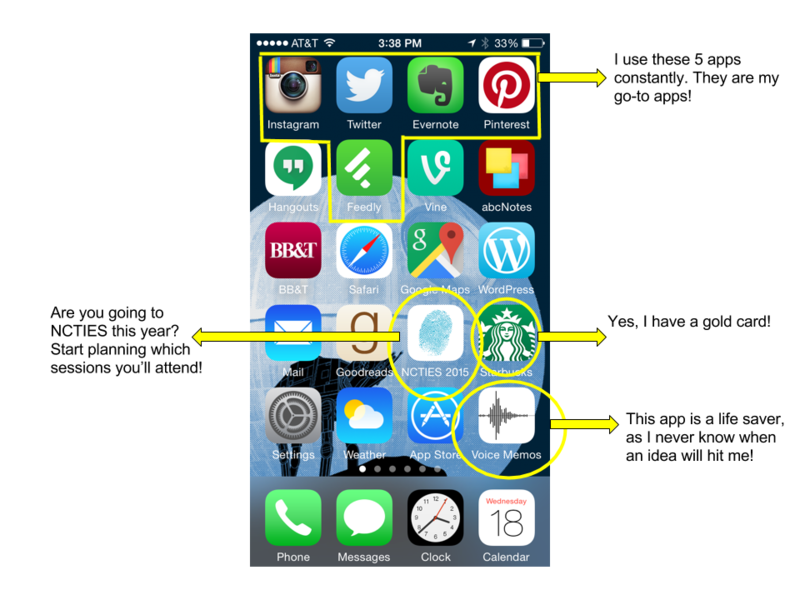 This year, I will be utilizing Evernote to curate all of the information from NCTIES. I will start by creating a Stack for NCTIES 15 and then create notebooks within that stack for each session I attend. The function that I really love about Evernote is that by using this tool to curate, I am able to tag each note, link, article, etc. that I add to a notebook so I can easily search and categorize things. I also like that I can add things to the notebooks (such as articles, bookmarks, photos), rather than just having to type my notes out the whole time. This allows me more time to listen and engage in the presentation. Whichever tool you choose to use, be sure to have a plan for how to curate before you go to your first session. If you have numerous colleagues that utilize Twitter for professional growth, create a unique hashtag that you will use during the conference anytime you tweet an original thought, a resource or tool, a photo, someone awesome to follow or a retweet that is valuable. By sharing this hashtag with your colleagues, they can follow you, in real time, as you make your way through the conference sessions. Consider using a tool such as Canva to create an infographic that outlines some of your most interesting thoughts, ideas and discoveries during the conference. Infographics are visually appealing, and with a combination of text, images, charts, graphs, etc, it will be easy to catch your colleagues’ attention. You can also use this infographic to advertise for professional development opportunities that you might want to lead in your school or peak someone’s interest in attending the conference next year. Unfortunately, most districts don’t have enough funds to send all interested teachers to the NCTIES conference. There will probably be some people in your own school who wish they could be there learning along with you. At the end of each conference day, think about the possibility of doing a live Google Hangout that your colleagues can attend, where you go over highlights of what you saw, learned and discovered that day. This is as easy as advertising to your colleagues the time and date when each live hangout will happen, and then sending them the link to attend. Your hangout doesn’t have to be long and you don’t have to try and recreate each session you attended. Highlighting awesome things that you will share and the trends that you’re seeing might be enough to peak people’s interest. I hope these ideas are helpful! So let’s all beg Mother Nature to end this snowmageddon and give us all safe travels next week to Raleigh! I hope to see you there! 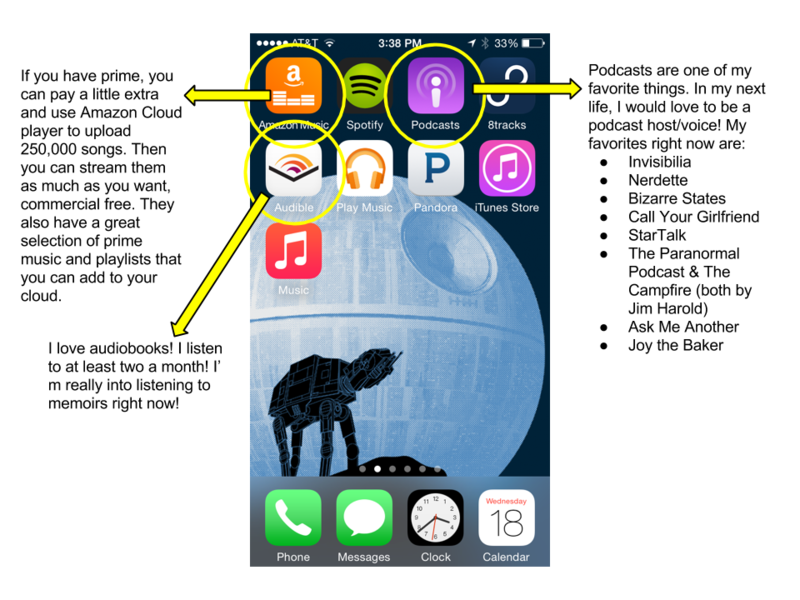 Infographic I created to share awesome apps for sharing on the go. This is a short, but awesome post about avoiding that overwhelming feeling of never being able to stay ahead of technology tools and trends. None of us will ever be able to keep up, but I love his advice on picking one new thing to try each month. I am a believer in picking one thing and doing it well, as opposed to trying everything and never mastering anything. What new tool will you focus on this coming month? Are you interesting in integrating coding into your classroom instruction? This Symbaloo contains tons of awesome resources for coding. It’s a great place to start exploring the world of learning to code. Top 20 STEM Education Podcasts You Should Be Listening to Now! Do you listen to podcasts? 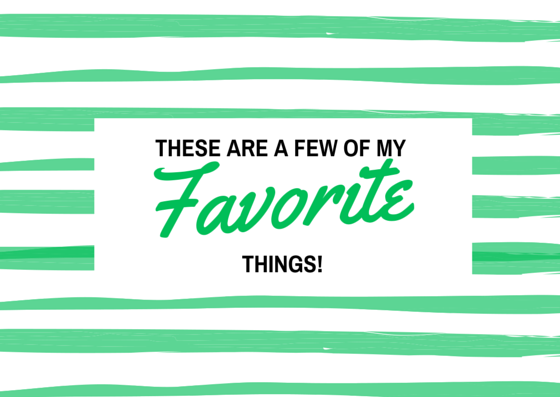 If you haven’t, they’re an awesome way to learn! This post has numerous podcasts that have a STEM theme! Aside from this list, I’m loving Nerdette and Invisibilia. Using infographics in the classroom is such a creative way to allow students to analyze and synthesize information, while maintaining their voice. This post shows how a teacher used infographics within a larger research project. This short piece by Seth Godin makes me think of many of the issues plaguing public education. Give the girl a standing ovation please! Can I just say, SNOW DAYS!!! Not one, but three days. That’s hours of extra time that I get to spend planning, collaborating, creating, reading, dreaming…and organizing! If you know me, then you know that I am a pretty neat person. My desk has everything in its place, so much so that even my students know where things are. Messiness makes me anxious and clutter gives me the urge to just start throwing things out! Since I’ve had a lot of extra time over the past few days to work from home, I decided that it was time to begin organizing my work life. I come across so much content on a daily basis that I can’t possibly read or look at it all. Because of this, I’ve collected an insane amount of bookmarks. I have to admit that my bookmarks in Chrome were organized pretty well, but I realized that I was always looking for something that was saved in my school Google account, while I was using my personal account or vice versa. This led me to log into my Evernote account, which I haven’t used in forever. I deleted all my old notebooks (I haven’t logged in for forever, so obviously that content isn’t that important to me) and built it from the ground up. I created all new notebooks and stacks and spent hours one day organizing all of my bookmarks into them. While the work was tedious, when I was done, I felt so accomplished! I love that I can use the app on my phone or iPad as well and it allows me to quickly sync and access all of the content I’ve curated. I have committed to using this tool for content curation, and I’m even considering upgrading to the Pro account so I have more storage. In addition to organizing all of my bookmarks and Web content, I also cleaned out my Feedly account to make it more concise. There were many feeds that I no longer has use for or that are no longer inspiring me. The organization didn’t stop there. I picked up my iPad (which I hadn’t used in months, I know, cringe!) and got to work organizing and deleting apps like crazy. I put all of my apps in groups based on functionality and use and separated the groups on various pages to make sure everything is easy to access. I had so many apps that I downloaded and promised myself I would open and try later, but later never came. I went through every app I had never touched and explored it to decide if it was worth keeping or not. I realized after I finished that the reason I hadn’t picked up my iPad in so long, is because I had page after page of random apps, and that chaos dissuaded me from using it at all. Lastly, I reorganized my iPhone. I had everything in groups, but realized, while this works great for me with my iPad, the extra clicking when I use my phone annoys me. When I’m using my phone, I usually want to be able to very quickly swipe and click, and even one extra touch can slow me down. For this reason, I took all of my apps out of their carefully created groups and set up pages based on use and functionality. I also weeded through and got rid of many apps that I no longer use that were truly just taking up space! Now my phone is so much easier for me to access. All of this organizing and deleting has shown me that I tend to grab and download things on a whim because I read a great review or see that someone else is using it in a cool way. And there’s nothing wrong with this, but because I do it so much, I never have time to actually explore everything I find. Being aware of this will help me to focus on quality, rather than quantity and, in turn, make better use of the tools I do have. Have any of you been organizing during your snow days? For the past two months, my friend and fellow librarian, Mollee Holloman and I have been working hard on our new venture. Since meeting each other over the summer at a local tech conference I presented at, she and I have kept in touch through Twitter. We have talked a lot about how hard it is as librarians to truly take a leading role in professional development since both of our districts have Instructional Technology Facilitators and it’s hard to entice our colleagues to stay after school for learning opportunities. While it helped me to know that this is not a struggle I am alone in, I wasn’t satisfied with simply sending out emails to my colleagues about tools and resources for tech integration. I am a huge advocate for professional learning and take part in this mys elf by constantly reading professional literature, remaining active with my PLN through Twitter and attending as many PD opportunities as I can virtually and in person. I am able to put much energy into growing professionally because I take the time to seek out these things, but not everyone around me has that kind of time. This realization is what led me to the idea of a virtual professional development site for my school. I have been so inspired by the work of Laura Fleming, with digital virtual learning opportunities and digital badges, as well as Richard Byrne of Free Technology for Teachers. Both of these educators helped me to construct the beginning ideas for what is now Quick Tech by TM. Knowing that I didn’t want to take this risk on my own, I approached Mollee and asked if she’d be interested in working together to create a site for both of our schools. She immediately agreed, so I filled her in on the ideas I had constructed so far, including framing the professional learning as challenges. From there, we were off and running. Through countless emails, texts and Google Hangouts, our idea was born. She came up with our name and together, we created the framework that we will use for each challenge we create. I am fortunate to be married to a web developer, who graciously gave Mollee and I much of his time to develop our site from the ground up. Once it was built, my husband showed me how to navigate the inner workings of WordPress, which in turn I shared with Mollee. What seemed so intimidating at the start (using WordPress), is now so easy for both of us. We have added our first round of challenges and are having a live Google Hangout on Air with the faculties from both of our schools next Thursday, February 19th at 8pm to launch our site. We have also created a Twitter account for the site and have begun tweeting and throwing around ideas for special weekly tweets and possible Twitter chats. To say that I’m beyond excited about this site is a grave understatement. I am thrilled that I have such an awesome librarian friend and partner to take this journey with and am humbled by the positive words I’ve already received from my staff concerning this effort and our live GHoA. Our main goal is to provide our colleagues with learning opportunities that are accessible, concise and relevant. Our challenges are built around what our colleagues need and want; designed with them in mind. And on top of that, we hope to have the staff of our two schools network and begin to grow and nourish their PLNs. In the end, we hope to inspire and empower others. I could talk for a long time about the numerous ways that written conversations encourage student engagement, ownership and voice. This approach, which I first read about in a blog post by my librarian she-ro Buffy Hamilton, is deep rooted in the idea that students should be participating not only in discussion, but more importantly in deep thinking. In the book The Best Kept Teaching Secret, Daniels describes written conversation as students engaging with each other through various types of texts, including, but not limited to, “handwritten notes, emails, dialogue journals, write-arounds, silent literature circles, collaborative annotation, threaded discussions, blogs, text messages, tweets and more” (Daniels 2). One way to do written conversations is with the write-around method. In this technique, students work in small groups to write and exchange notes on specific curricular topics. This is done in several rounds, with students participating in sustained writing for anywhere from a few minutes to 15 minutes. Students then actively engage in out loud conversations about what they’ve written and learned. This method is an excellent way to give all students a voice and allow the to work collaboratively to create meaning and analyze and synthesize various texts. Students are given the opportunity to share without fear of ridicule or being “wrong” and are able to learn collaboratively by being exposed to the various perspectives of their peers. During many in-class discussions, a small handful of students are engaged, while the majority either sit passively or zone out. With written conversations, all students are engaged and have the responsibility to add their thoughts to the discussion in a safe way. Another plus of this method’s effectiveness is that it’s entirely low/no tech. All you need to get started is a purpose for the activity, bulletin board paper, the texts you want to use and sharpies! I recently partnered with the AP US History teacher at my school to collaborate on a written conversations activity. She came to me with concerns about her students’ ability to analyze and synthesize primary source documents when writing document based questions (DBQs). She wanted to work on a way to help her students ease into writing quality DBQs. The write around was a perfect match with DBQs since her students struggled most with analyzing and synthesizing the primary source documents. In the end, her students were able to “discuss,” through their writing, the 7 primary source documents that they had to include in their essay. This gave them a chance to make insights, pose questions and offer responses to others’ questions in a safe environment where everyone had a voice. The students gave us great feedback and loved the activity. Mrs. Crank was also pleased with how well they were able to discuss the documents in their essays. Written conversations are like any other teaching method or learning opportunity. You must have a purpose in mind, as the technique is only a tool to facilitate thinking and learning. We began by identifying what her students were struggling with and decided the the write-around method would be a great way to allow all of her students, even the most quiet and shy, to work collaboratively to understand and apply primary source documents. Once we had our purpose determined, we worked to find the primary sources that we would use as our “texts” and the building blocks of the students’ DBQ they would eventually write. With this activity, there is a lot of front loading involved. Almost anything can become a “text,” including things such as infographics, student work and even Tweets. After blowing up the primary source documents (so they would lend themselves to easy reading and annotating), I taped them to large sheets of bulletin board paper. These become the vehicles for the written conversations. We spent about 10-12 minutes introducing the method to her students. I prepared slides to give them an overview of what a written conversation is (with picture examples), our procedure for the activity and how we would share both silently through our writing, and out loud during small and large group sharing. After allowing them to ask questions for clarification, we jumped right in. The students were slightly hesitant during the first round, but once they moved to their second document, they were very enthusiastic to read and respond to what their peers had written. You can view the slides I used to introduce this method to our students below. They moved through all 7 documents with 1 small group share done half way through the activity. After they had commented on all of the documents, we had a large group share where we allowed them to discuss what they were still unsure of, make comments about their synthesis of the documents and how they feel the activity would benefit them. We ended with them completing a very short Google Form to give us feedback for next time. The students’ feedback was overwhelmingly positive. All of them commented that this activity 100% helped them to write a better response to the DBQ that followed. They told us that discussing the documents in this way was low pressure and made them more willing to share their ideas. The one criticism we got was that they wished we had done this activity more throughout the course! I have since done this activity with other classes and even done variations to suit the purposes of other teachers. If you’d like more information on how I set this up or just some help getting started, feel free to contact me!